1988 | Color | 89 min. Starring: Ted Prior, Cameron Mitchell, Troy Donahue, Fritz Matthews, David Campbell, Dawn Abraham, William Zipp, and Suzzane Tara. 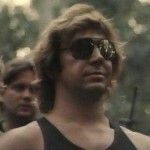 There are quite a few films which I consider “mandatory viewing” for those just beginning their journey into the wonderful and bizarre world of bad movie fandom. It goes without saying (but I suppose I’ll say it) that anyone interested in b-movies should first familiarize themselves with the classic, drive-in era dreck like Plan 9 from Outer Space, Robot Monster, From Hell It Came, and The Giant Claw. 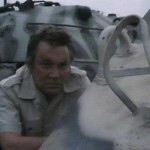 While those films definitely provide a good starting point, there are many lesser-known films, like Godfrey Ho’s Ninja Terminator; the midget spy spectacular, For Y’ur Height Only; and the surreal tale of a demonic piece of bedroom furniture, Death Bed; which are no less essential viewing for the aspiring cult cinema connoisseur. Then you have those “must-see” bad movies which are so goofy, even the folks who stick to the more mainstream side of cinema can enjoy. 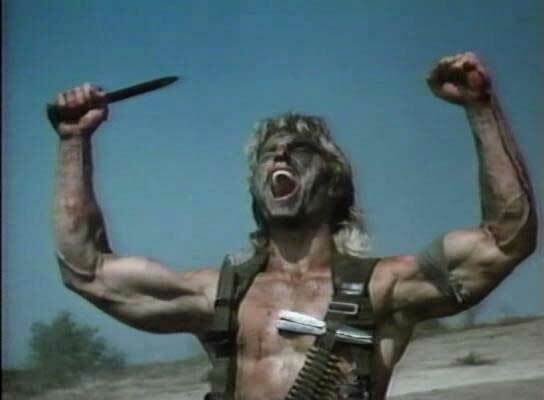 Films like the infamous Troll 2; the silly space opera, Space Mutiny; the incoherent, Scientology-fueled nightmare that is Battlefield Earth; and, the subject in question today, Action International Pictures wonderfully-ridiculous action flick, Deadly Prey. 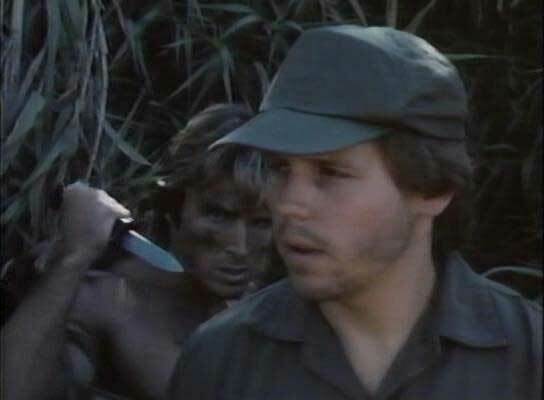 Frustrated by the lack of suitable “runners” for his sadistic, live-fire training exercises, Colonel Hogan, the commander of an illegal army of mercenaries, hastily orders his top men to go out and find someone who’ll give his troops a real challenge. 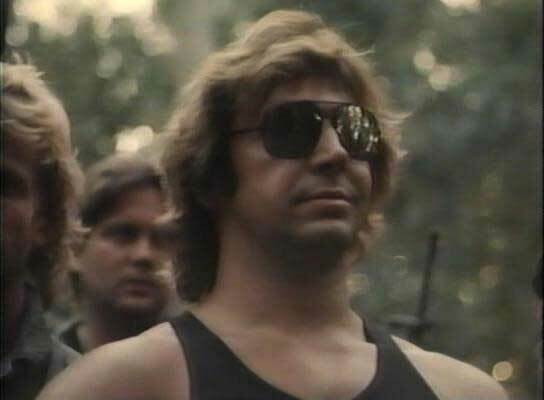 Unfortunately for Colonel Hogan and his rag-tag army, the man they capture just so happens to be an unstoppable, musclebound, and be-mulleted killing machine named Mike Danton. Ahh! 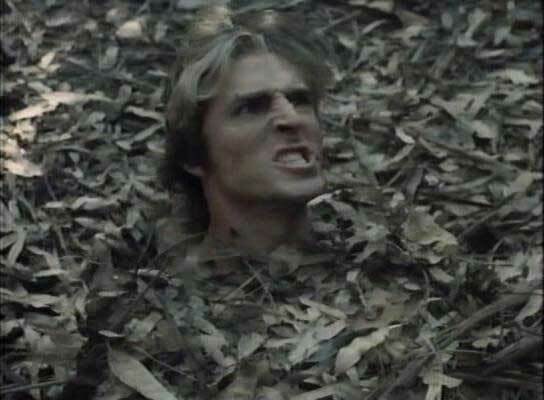 A sentient leaf pile…and it’s all pissed off! Alone, unarmed, and shall we say, somewhat unhappy about his situation, Mr. Danton spends the entire film demonstrating the numerous flaws inherent in Col. Hogan’s unorthodox training methods by systematically killing off his entire militia. Danton stabs them with hunting knives, shoots them with machine guns, skewers them with sharpened twigs, and occasionally stuffs grenades in their trousers. Danton single-handedly decimates Col. Hogan’s makeshift mercenaries in a way worthy of being recounted in a song by Dethklok. Amazingly, Mr. Danton manages to wreak all this havoc while being grossly outnumbered, completely outgunned, and disturbingly under-dressed. Although, in fairness, his tormentors do appear to lack the basic attributes a military unit would require of its members. Attributes like peripheral vision (In one scene our hero hides in a tree which is completely devoid of foliage. 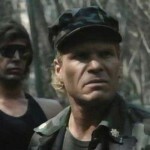 ), tactical knowledge (Hogan’s men have superior numbers, automatic weapons, and freaking tanks…Mike Danton has no pants. ), and even the smallest shred of common sense. Let’s just say these guys aren’t exactly Special Forces material. No, this sorry group of wannabe-soldiers make Gomer Pyle look like Audie Murphy. Of course, Col. Hogan’s men aren’t the only folks in this film who are severely lacking in the critical thinking department. None of the main characters’ decisions make any sense whatsoever. 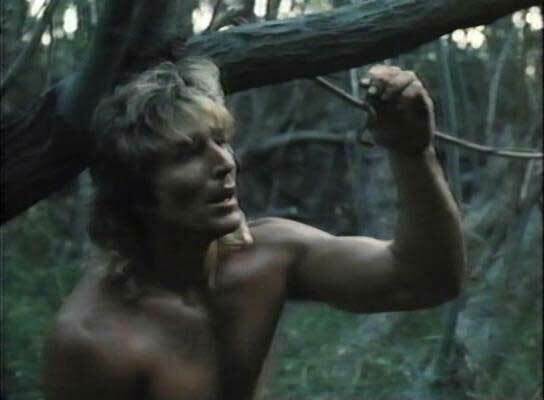 For instance, our hero, after spending roughly thirty minutes in the woods without food, inexplicably feels compelled to eat worms to stave off the unbearable hunger pangs which apparently result from going without food for the length of an entire episode of The Simpsons. Not to be outdone by her borderline-psychotic spouse, Danton’s wife, Jaimy, instead of contacting the police after witnessing her husband’s abduction, decides the best course of action would be to call her father, played by veteran character actor, Cameron Mitchell. 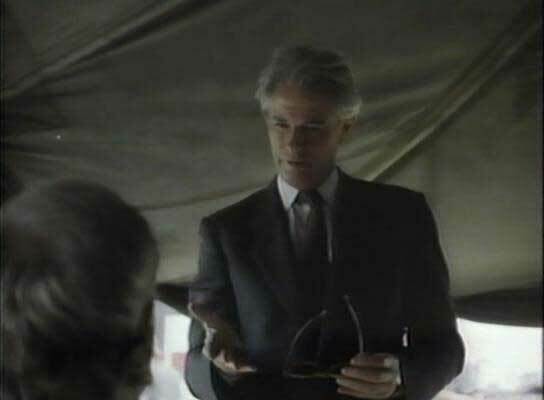 In her defense, Mr. Mitchell’s character (he’s never given a name, by the way) is a former police officer, yet even he decides against alerting the authorities. In fact, he doesn’t even deem it necessary to have his daughter placed under police protection (Bah! Just lock the doors, I’m sure you’ll be fine. I mean these guys only overpowered and kidnapped your unstoppable, Killdozer of a husband. What’s the worst that could happen?). No, instead he decides to take it upon himself to sneak into the heavily-guarded militia base, without backup of any kind, to learn more about their operations. 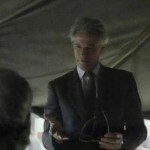 And yes, as you’ve probably already guessed, the doughy, sixty-something Cameron Mitchell is able, with very little trouble, to infiltrate the encampment of these “highly-skilled” mercenaries, find out the identity of their major financial backer, and get out of there unharmed. I’m sorry, but these fools couldn’t overthrow Verne Troyer in a game of backyard football, let alone a foreign government. Finally, someone is going to kill Artie Lange. 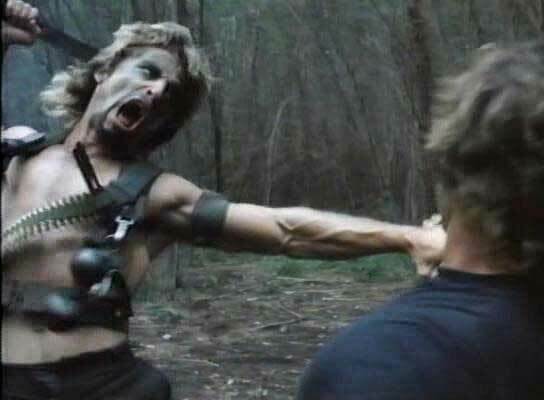 And its that kind of absurdity which makes Deadly Prey so damn entertaining. 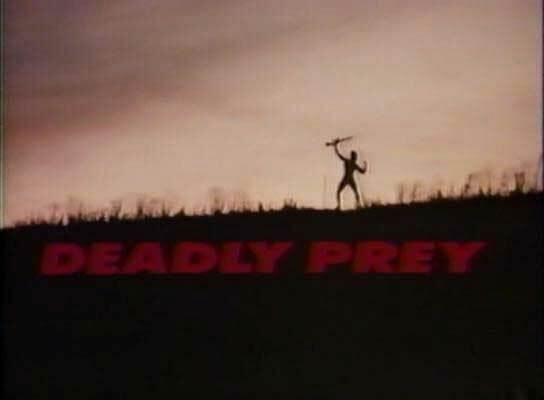 I’m not going to mince words here, Deadly Prey is without a doubt, the finest example of the over-the-top, direct-to-video action genre ever produced. 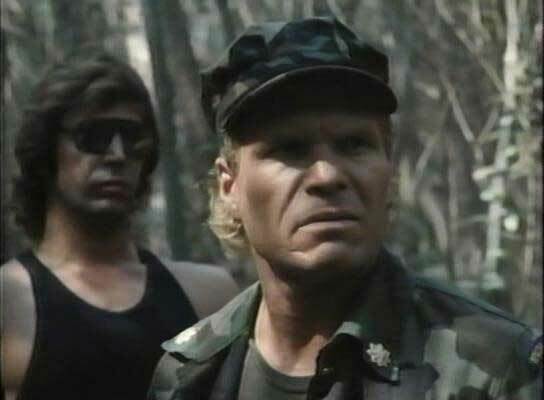 Essentially The Most Dangerous Game meets Rambo, it features the prerequisite invincible hero, bad guys who graduated from “The Imperial Stormtrooper School of Marksmanship” (i.e., they can’t shoot a damn thing. 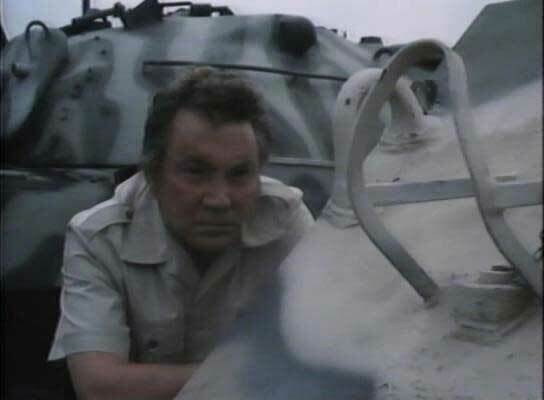 ), plot-holes so large, Rosie O’Donnell could cartwheel through, dialog which is comprised almost entirely of clichés, and what is perhaps the greatest sequence in b-action history (see video clip below). It is silly, derivative, and mind-bendingly stupid—and if you are anything like me, you’ll love every damn second of it. 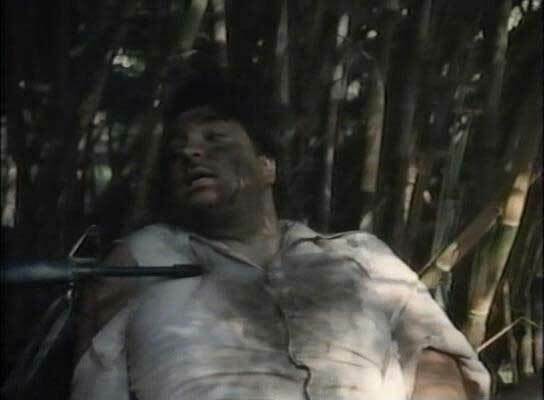 In this scene, Mike Danton witnesses his wife being killed and well, let’s just say he doesn’t take it very well. Although the soldiers in the movie give me the greatest comedy relief, you almost feel sorry for them and just wanna help them by jumping in and showing how it is done. A very entertaining movie to pass a few quit hours away.